Free hotel and valet parking is available at the Venetian. 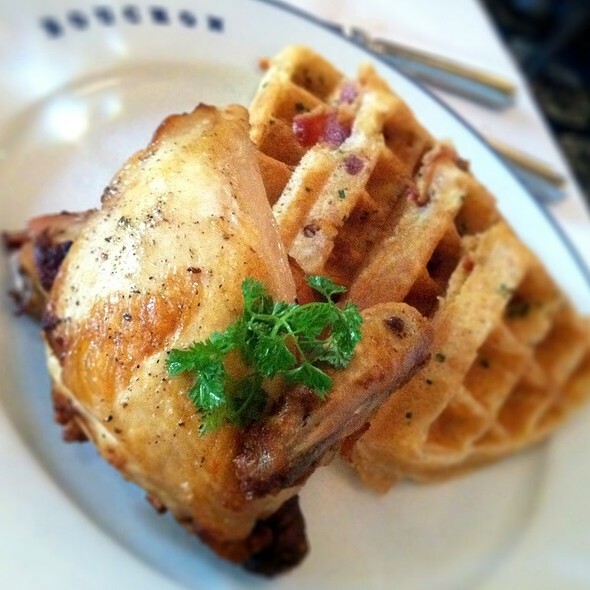 Bouchon is located in the Venetian Resort-Hotel-Casino, Venezia Tower. Renowned designer Adam D. Tihany has masterfully created a beautiful interior that features a magnificent French pewter bar, a vibrant mosaic floor, deep blue velvet banquettes, antique light fixtures and an expansive hand-painted mural by noted French artist Paulin Paris. The exquisite décor is the perfect setting for Bouchon’s culinary delights. Chef Crain rediscovers the classics, using historical reference points and classic French techniques, combined with a modern approach. The menu offers classic bistro dishes including steak frites, roasted chicken, quiche, brandade, boudin noir, pot de crème and profiteroles. The selection of fruits de mer is celebrated as one of the finest in Las Vegas. The seasonal menu changes throughout the year and is enhanced by a blackboard menu featuring the best products available each day. 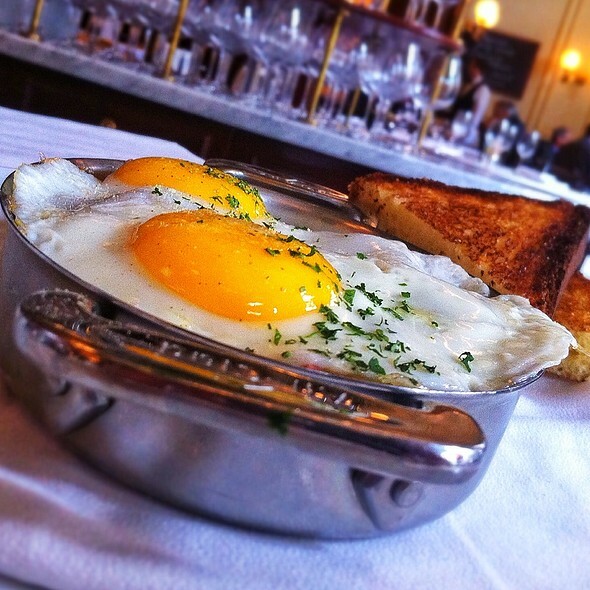 Flawlessly executed in every aspect, Bouchon delights both the palate and the eye. 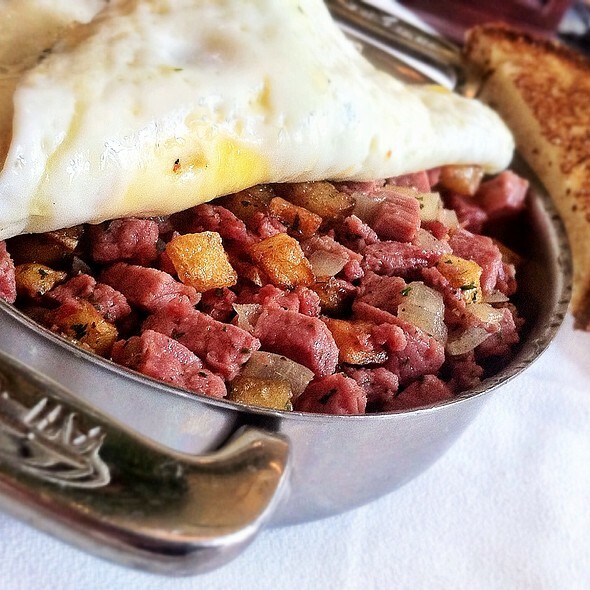 "Un repas sans fromage c'est comme une journée sans soleil"
Thank you for your reservation with Bouchon Bistro Las Vegas. 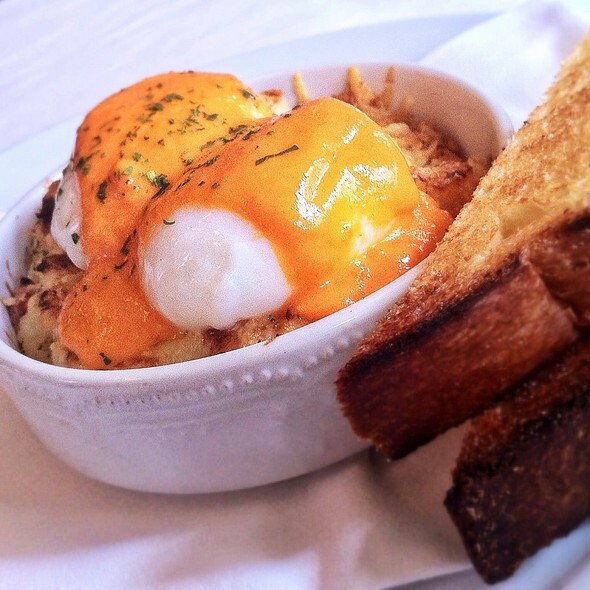 We will only be offering a prefixe menu for brunch at $40 per person this day. Excellent service, delicious meals, careful consideration of allergy restrictions. In general I was very disappointed. 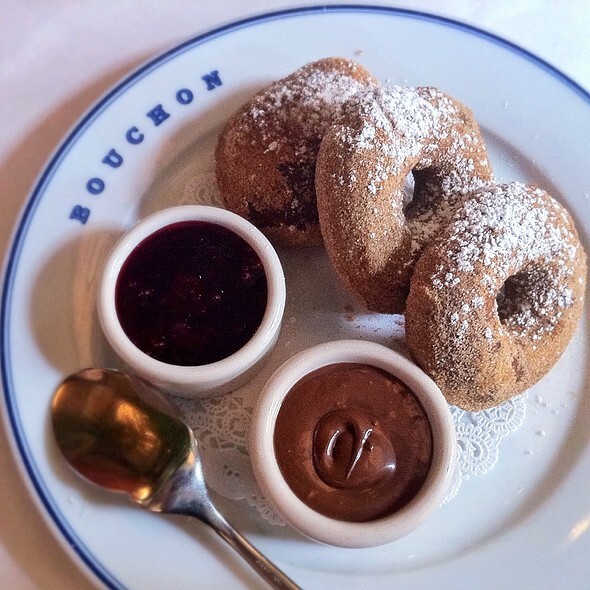 Had eaten at the Bouchon in California and absolutely loved it. This was a completely different experience. The service was not great. We were given a drink/wine menu when we sat down but were never asked if we wanted a drink or if we had any questions. We ended up not ordering anything to drink. My steak was overcooked and under seasoned with no sear on the outside. My friend's lamb was also under seasoned, and the portion size was small. Dessert was underwhelming. I was quite surprised by the fact, that restaurant's signature dish (Steak) for $40 USD have a pretty mediocre taste. If you order steak for $40 USD in a French restaurant you expect that it will be at least very good, if not awesome. However, I got quite a small steak with TONS of fries. And that's it. It's simply not cost $40. Period. However, the dessert was excellent, as well as the wine. Service is so sad, no Manager in the Restaurant, never asked us if everything was fine. Ernesto was an amazing waiter, best I’ve ever had. Food was excellent as well. Very good French bistro. Delicious food. Waiter was a bit bumptious. And the restaurant is no respite from the Vegas assault on the ears. The food is amazing and the wine selection is delicious!!! The service is also very good the only down side is the noise although is understandable due to the time and crowd in the restaurant. Amazing food and service! Bouchon never disappoints. We will be back! The most difficult part was choosing which of the many delicious dishes to order. Quiche of the day was magnificent. We had food delivered to us that we did not order. Food was okay but not exceptional as I expected. I had such high expectations considering it was a restaurant by Thomas Keller. However, I was deeply disappointed and the foodie in me died a little. The food was overly salty and when it was evident that my friends did not enjoy their food by not eating it, nothing was done to remedy the situation. We made a reservation for Friday night at 6:30 p.m. The service here is excellent and our server was very attentive. We ordered the beef tartare, the parfait foie gras, and devilled eggs as our appetizers. Before they brought out these dishes, they served us a little bowl of roasted pistacchios, and the bouchon twisted bread. Everything was absolutely delicious. The foie gras was one of the best foie gras I have tried. If you're a fan, definitely order this. For our entree, we shared the crispy pork belly on polenta. We didn't even ask for them to split the dish for us, they automatically came out with two nicely plated portions. As the service was so quick and efficient, we had time to order the creme brulee for dessert. We still made it in time for our 9:30 p.m. show after. Would definitely come back to try other dishes here. My first experience at Bouchon was great and I would definitely return or recommend it to a friend. The service was extremely attentive and the food was amazing! I was pleasantly surprised when they brought out creme brulee on the house for myself and my fiance to share for my birthday. The only aspect I was a bit taken aback by was the paper menu, which appeared to be re-used for new guests. The table next to mine featured a paper menu with small grease stains dotted across the front. Overall however, I was thrilled with the experience. The food, the service and everything was so good that we returned for a second visit within a week. The oysters were so fresh, do try them. Delicious, great service. We will return when we return to Las Vegas. The Bouchon was definitely worth the dining experience. It started with homemade authentic french bread served with some of the best butter I ever tasted. Pistachios were served complimentary alongside the amazing bread. From there, we moved on to an appetizer of a cheese platter which included cow, goat, and sheep cheeses, sliced apple, honeycomb, walnuts, and grain bread. Our entrees were beyond amazing and definitely hearty portions. I recommend the Poulet Roti entree just for its flavorful sauce; even though the entire entree was worthy. We finished with two desserts: a creme brulee that was rich and creamy and a strawberry and rhubarb tart topped with a lemon ice cream that was one of the best flavors I ever tasted. This amazingly delicious meal was washed down with a hearty full bodied Bordeaux. I highly recommend Bouchon for a memorable dining experience. Made the 9:30 pm reservation a week ahead for a birthday dinner with a party of 6. Food and service were spectacular — but we were seated in a bar area booth near the busy kitchen doors and never really were able to get a sense of the restaurant space. A bit of a shame, considering the $600 bill. I absolutely loved everything about the restaurant except one thing. Our waiter was kind of annoying. It was my 50th birthday dinner and the waiter brought a us a complimentary lemon custard slice which was very nice. When he served it he said “hey how about a shot of tequila, I can get you a shot of anything.” He made it seem like it was a birthday treat but he changed us for it. $15. Still love the place. This beautiful restaurant is in a great setting. The outdoor patio was lovely. The food was exceptional and the service was outstanding. Enjoyed the warm bread and pistachio nuts brought to the table. The waitress had great suggestions and the lamb was perfect. Only too many fries with the flat iron steak. This was honestly the best meal I've ever had in Vegas. My mother and I came for dinner, had a reservation, and were seated immediately. The duck appetizer was perfect. Not to mention the delicious Creme Brule. I will be coming back every time I come to Vegas. Best meal we had in Vegas, bar none. Everything was very well made, with excellent service. The biggest challenge--as with everything in these huge casino hotels--was just finding the place. Once we were in the door, though, we had a great experience. Wonderful French meal! Oysters were fresh, escargot was amazing and steak frites was spot on! Excellent, attentive service. One of our favorite restaurants anywhere. Très bon restaurant. Le service était impeccable et la nourriture aussi. J’y retournerai sans hésiter. Absolutely perfect ! Rosie , our waitress was amazing. Even when I changed the foiegras recipe she didn't bat an eye. My son's ate every bite. Thank you for a wonderful evening. Honestly, I was not impressed. Making reservations for our anniversary to supposedly one of the best restaurants in Vegas we expected to have a great meal. While the food we ordered was ok, our choices were limited. Out of the eight entrees they have on the menu, they were out of four. Never, ever happened before to go to an upscale restaurant and the dishes on the menu not to be available. Class operation. I would expect anything less from Tom Keller and staff. Great meal, great service and would definitely go there again. Good overall! Service was OK but not above average for type of classy restaurant. Will return. Thanks! 4 out 5 courses were very salty. A little disappointed in the foods..
Amazing food, very attentive staff! Food definitely lives up to a Tom Keller restaurant. The décor also truly feels French. Overall, a wonderful night! Food was disappointing. Steak was very chewy and tased gamey. Nice atmosphere and good service, but don’t expect great food.